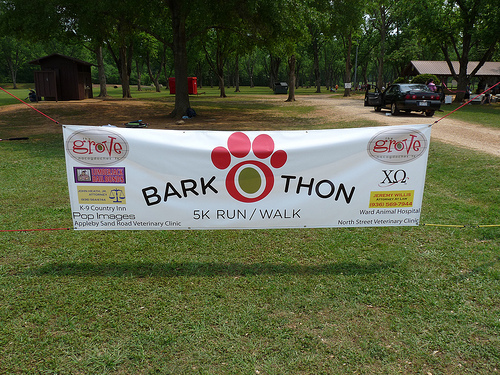 On Saturday I ran the Barkothon 5K, which benefited the Nacogdoches Animal Shelter. 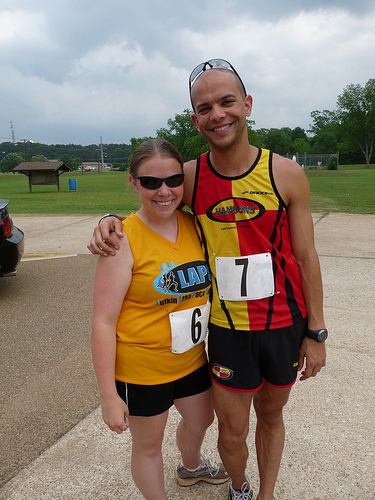 (Fun fact: this was my seventh 5K race since I started running three years ago!) I had grand plans of finally breaking 25 minutes and initially thought that this would be the race - I've had a pretty good season of running, my yoga practice has been consistent and strong, and I'm in a great place mentally and emotionally. However, as race day loomed I realized that my lack of speed work, the heat and humidity and a strange start time meant today was not the day for setting records. But not aiming for a PR didn't mean I couldn't have a good time or run my heart out - I did, on both accounts. Here's how the race went down. The race had a start time of 2pm. Now. I am a morning runner, and for a good reason. I live in East Texas, you see. Here, summer starts in mid-March and lasts until Thanksgiving. We've already had a string of days where temperatures rose to the 90's, and have I mentioned the humidity? We like to hang out around 85% as a general rule. Needless to say a 5K race, in late April, at the hottest part of the day, did not bode well. On the other hand, an afternoon race meant I didn't have to skip my morning yoga class. A 90 minute practice the morning of a race is probably not a good idea if you plan to PR, but for the lady who just wants to have fun, run with friends, and support the animals it was just right. Me, Nathan and Mud, Kate's dog who volunteered to be our prop. Our friends Christy and Chip! Great runners and even better people! We got to the park where the race would start at about 1pm, registered with no problem and then admired the adorable dogs that were up for adoption. This is never a good idea. 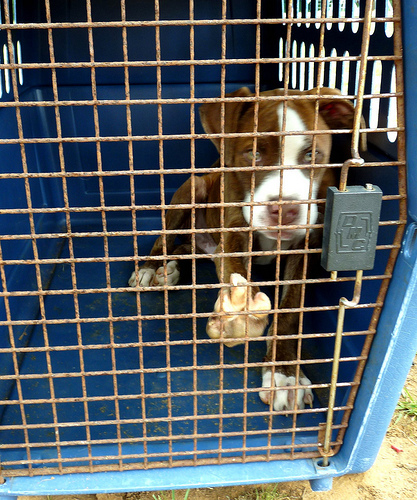 When faced with dogs in cages, who have no couches to sleep on and no people to love, I often end up crying and trying to convince Nathan that we can take them all home. Saturday was no exception. Luckily Nathan talked me out of stuffing our apartment with more dog than it can handle and I spent my pre-race time giving the pups all the love and attention I could offer. 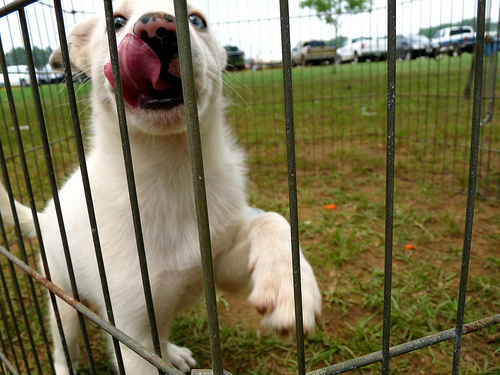 This pup had one brown eye and one blue eye! As for the actual race? It was okay. I forgot my Garmin, which was fine since I wasn't planning to actually "race" anyway. It was very hot and very humid and I basically just found a pace that felt okay and tried to maintain it without slowing down or walking. At one point, I actually took a wrong turn which ended up being a very slight short cut. I doubled back a bit to try and make up for my mistake, but I felt terribly guilty for the rest of the race. My faux pas didn't allow me to pass anyone, and no one passed me (I was running alone for much of the race, which is the main reason I didn't know which way to go) so I don't think it made too much of a difference. 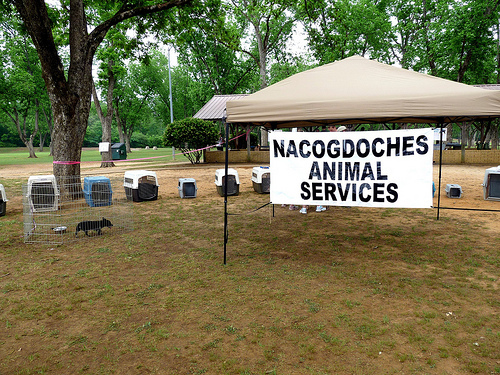 There weren't any age group prizes (since they were raising money for the shelter and prizes = money) so no harm done. When I finished I didn't even bother to find out my time - the organizers were busy and I didn't really care, but I will estimate that it was around 27 or 28 minutes. 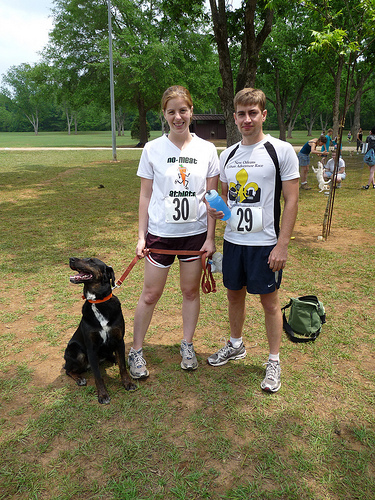 According to the local paper, the race raised nearly $3,000 for the shelter. I can't think of a better PR or a better way to spend a hot and humid Saturday afternoon.